Regular coffee drinkers are known for a touch of pre-cup grumpiness. But on March 20, thousands of caffeine-deprived souls remained out-of-sorts even after a normally nerve-soothing visit to Starbucks. Their ire was the result of protesters who are determined to dictate exactly what sort of latte consumers will be allowed to sip. Now I love protests more than politicians love, well, themselves, so I decided to check out the action at the Dupont Circle Starbucks. My first sight was a 50ish, long-haired-yet-balding man--a jittery version of Frohike from the X-Files--hassling the teenage counter girl for only offering "fair trade" coffee beans, not the brewed stuff. Nothing screams "revolution" like hectoring a high school kid. Outside, about 15 people were pacing the classic protester circle and handing out Xeroxed brochures on the evils of genetic engineering. Squared off against them, Galileo v. Inquisition style, were ten grinning counter-protesters, waving homemade signs that read "I love Starbucks a latte!" and "Don't tell me what to drink." 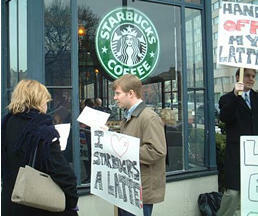 The anti-Starbucks group seemed offended by the confrontation. The sullen fellow from the counter muttered, "Just wait until you demonstrate against something and we show up." The reply shot back: "Of course you'll be there: we only protest you guys." There was no real drama in the streets, but it was far more impressive than the protesters' arguments. The company is being pilloried for three things: first, for using dairy products that come from cows treated with bovine growth hormone (rBST); second, for not doing enough to raise wages in coffee bean-growing countries; and third, for not selling brewed "fair trade" coffee in its cafes. In addition, the protesters demand that Starbucks forever swear off genetically engineered coffee, which it doesn't currently sell. Fearing bad publicity, Starbucks is folding faster than a Gap employee in training. Starbucks' CEO Orin Smith issued a statement saying that the company soon hopes "to be able to offer all of our milk products rBST-free." And there's certainly nothing wrong with Starbucks responding to consumer demand by offering such milk as an option. Businesses succeed by catering to the tastes of their various customers, even when those tastes are based on irrational fear. But it's a mistake to go full-bore anti-technology. Cows treated with rBST produce as much as 15 percent more milk than untreated cows, which translates into cheaper cappuccino. The Food and Drug Administration--not known for its willingness to let risky products on the market--has repeatedly determined that rBST is safe and that, in fact, milk from hormone-treated cows can't be distinguished from other milk. As former surgeon general C. Everett Koop has said, "Milk from cows given [rBST] is the same as any other milk. So, there should be no doubt in the minds of consumers that the milk they drink is just as safe, nutritious and wholesome as it has always been." The OCA's demand for organic farming is equally senseless. A worldwide switch to such methods, which are far more resource intensive than modern farming, would starve millions of people and doom many endangered species. The health and environmental benefits claimed for organic foods have been repeatedly debunked by scientists. American consumers consistently show that they aren't afraid of biotechnology. Yet the OCA's letter to Starbucks warned that, "As consumer concern over genetically engineered food increases ... Starbucks may face financial and reputational risks from product recalls or from consumer protests outside your cafes, boycotts, shifts to other brands, and shareholder protests." Of course, what the authors really mean is that "our groups will protest outside your cafes" and "we will buy $10 of your stock and raise hell at your meetings." That isn't a mass consumer movement, it's a threat. 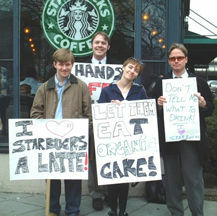 Their ultimatum is spelled out near the end of the letter: "If you are unwilling to contact us and begin negotiations that will result in a time-line for implementation of these three demands, you leave us no choice but to launch a national and global campaign highlighting Starbuck's unwillingness to address consumer demands for safe foods sustainably produced." Comply, or we will bury you. Who are these people to "negotiate" on my behalf? If coffee-drinkers become concerned about the safety of Starbuck's products, they will stop going there. Shareholders will dump stock and the company's profits will plummet faster than Bill Clinton's poll numbers. Is any of this happening? Of course not. Worst of all, the OCA would throw thousands of Third World workers out of their jobs by insisting on policies intended to artificially inflate wages in coffee-producing nations. Refusing to trade with countries that cannot match U.S. wages or working conditions is exactly the wrong approach to raising living standards abroad. The OCA's brand of humanitarian protectionism may be "killing with kindness," but it is killing nonetheless. American businesses should stop pandering to the fear and ignorance of the political fringe. If OCA members want to grow food the way my great-great-grandfather did, fine. Just stop pestering those of us who prefer to live in this century and let us enjoy or morning coffee in peace. Aaron Lukas is an analyst at the Cato Institute's Center for Trade Policy Studies.